Hey guys, I purchased a Quickor front sway bar about 3 years ago and I am finally getting around to install it and I, for the life of me, can not get it to fit. So the bar has the big dip in it to clear the engine but I can't tell if the middle of the bar should be above or below the plate that sticks out in front of the front cross member. I can get it above the plate but I can't rotate it up enough to attach the end links with out the bar hitting the crossmember. If I go below the crossmember then I am no where close to making it fit. Am I missing something obvious? Does anyone have any photos of how others are mounted? I have searched around some but I can't find much besides people that have made standoffs and attached the sway bar below the lower control arms. the bar in its stock configuration is between the oil pan and the lip on the x member. Is it possible you've recieved a swaybar for a SR motor install? Looking at your picture I see if the crossmember center section was reversed like it would be for the SR, the swaybar would easily clear. 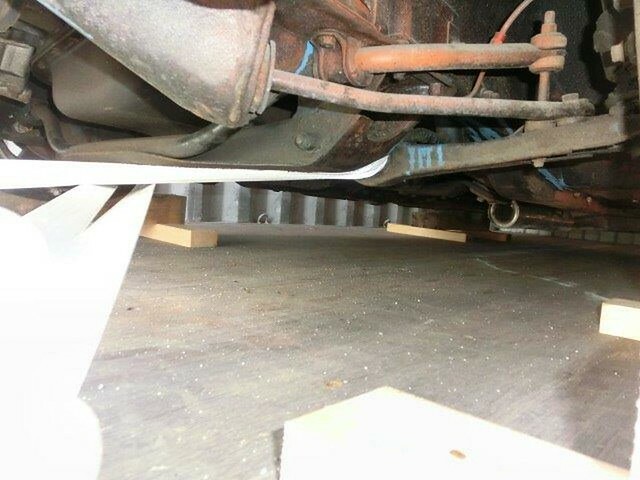 Putting the car on the ground would easily put your swaybar against the stock crossmember. Thank you guys for the input. 3b's I think you might be right that I got sent an SR bar instead of standard 510 bar. I will get hold of the folks at Quickor and see if I can get this resolved. So after looking at other crossmembers I thought I could cutting back the the front lip of my crossmemebr would allow the sway bar to rotate enough to work. I cut off about an 1.5" and now I can get the end links on but when the wheels are under load the sway bar still hits the front crossmember. I think I can still cut off about another 1/8" off the X-member which will get me a bit closer but not close enough. Can I shorten the through bolt on the end links to make up the difference or is that a bad idea? Through the arc it only hits the sheet metal you've already cut off or it hits the structural part of the x member? Mine was contacting the X-member in the same way. No matter how short the end links were it was still making contact before the suspension bottomed out. I had to make standoffs and re-profile the bar to make it work. Icehouse, it is still hitting the Xmember even after I cut it. Funwithmonkeys - thank you for the reply. Who made the bar you are running if I may ask, and how did you re-profile the bar? Having a good front sway bar is such an important piece and it seems like there isn't a good reasonably priced bar out there. Funwithmonkeys - I just went through your build thread and saw what you did. I guess that's what I will have to do as well. It's a shame that bar doesn't fit right out of the box. Anyone else have a good recommendation on a sway bar that they know bolts right up? This is the best picture I have of mine, and it's crap, sorry. KiKiIchiBan wrote: This is the best picture I have of mine, and it's crap, sorry. Interesting. I like how the TC rods are bent to avoid hitting the sway bar. Also something worth noting is that if your LCA reaches 14 degrees of upward angle the outer tie rod binds. 5 degrees is 1" of travel. You my friend are living on the edge. I've know 2 people to break the tie rod because of that. It also makes the car drive terrible. That's exactly how it came from Japan, some backyard engineering maybe. I've not even begun to think about what to do with the suspension so thank you for the info, a broken tie rod would not be fun at speed No idea if the bent TC is DIY or how it came from the factory on the Coupe? Never seen another one, it's definitely an area that will require some change. Button wrote: Funwithmonkeys - I just went through your build thread and saw what you did. I guess that's what I will have to do as well. It's a shame that bar doesn't fit right out of the box. The bar did fit right out of the box. I ran into issues as I lowered the car. Before I lowered it the bar would connect with the crossmember buy it was just before the suspension bottomed out. As it got lower (not Icehouse low) it was hitting sooner and we'll before the suspension bottomed out. That made it a bit interesting when you would hit a bump in the corners. Ahhh that makes sense funwithmonkeys. Perhaps my issue is that I have the car pretty low. I guess i will have to modify it like you did. KiKiIchiBan wrote: No idea if the bent TC is DIY or how it came from the factory on the Coupe? Never seen another one, it's definitely an area that will require some change. My coupe had straight TC rods just like the rest of my 510's. Yours is for sure a back yard "upgrade"